The Boy In My Son’s Window – Hi Blog! I'm Dad. Father’s Day was a warm one this year. We had a great time, but leaving the house for dinner felt like a chore. We were all hot, tired, and just ready to feed our faces. Unfortunately, going to a Long Island restaurant on Father’s Day can often feel like a visit to the Department of Motor Vehicles on Awful Day. Between the waiting, crowding, and the noise, it can be a little maddening. Scenes like that always make me worry about Lucas. While his older sister can endure these types of outings with only moderate whining, my son sometimes doesn’t adapt as well. As a non-verbal seven year old with Autism, Lucas can get antsy and fidgety. Even with his iPad mini firmly in his grasp, he will sometimes find himself overwhelmed with boredom. I try to keep that in mind and focus on making sure he’s content. This day, he really held himself together. Sure, there was some aggravation over what turned into an unusually long wait, but we made the best out of it. Sitting nicely at the table with the view of Freeport’s waterfront behind him, Lucas was bouncy and happy, so I was too. We all were. From over his shoulder, through the window, I could see a slightly older boy seated at an outdoor table with his family. It was my peripheral vision, but I could clearly see him jumping around in his seat and seemingly entertaining his mom and dad. I barely noticed them at first. After all, I was there to focus on feeding my face and having a good Father’s Day. As the meal went on, I noticed the boy peering through the window at my son’s iPad. Again, it was just from the corner of my eye, so I didn’t get a clear view of it all, but I could see it happening. My dad senses spiked, but ultimately I ignored it and figured it was just what kids do. They’re curious. There was nothing wrong with that and, as long as no one bothered us, I wasn’t bothered. We were fine. Lucas, I want to add, was being fantastic here. The food took forever to come out, but he displayed a great deal of patience. I couldn’t have been prouder. While my focus was on how wonderful my son was, though, my hazy side view peered over his head to the window behind him. That’s where, I was almost positive, I saw the boy look at him, laugh, and turn back to his family. Then again, I knew that would ruin Father’s Day and, probably, my life, all for an offensive action that I wasn’t sure was even happening. To be honest, I was more confused by it than angry. Keep in mind, this rarely happens to me. Strangers don’t comment on Lucas or cause conflict with him when I’m around and, because of that, I constantly struggle with not wanting to overreact to ambiguously minor moments. This felt like it might be one of those, so I took some time to process it and see if I should maybe relax. Yeah. This kid was about nine years old. Most children don’t do that in the middle of restaurants when they start hitting that age. I know my daughter didn’t. It seems like something more in tune with what Lucas would do. For the first time the whole meal, I really looked at this boy and his family – not from an angry side gaze but from a direct stare. That’s when I saw it. He wasn’t making fun of Lucas. He was just like Lucas. I don’t simply mean that he appeared to be non-verbal. He did, but he also shadowed my son’s mannerisms and behavior more than anyone I had ever seen. He laughed wildly as his parents bopped him up and down on their laps. I noticed his darting glances, casual shouts, and, for the first time, I saw his iPad. It was the same as the one my son has – complete with a matching carrying case. That’s what they had been looking at. That’s why they had been laughing. The stares, laughs, and seemingly rude behavior was all just their reaction to seeing something they thought was similar about us, not different. I never saw it coming. I’ve thought a lot about that day. I’ve gone over my false assumptions and paranoid approach to strangers. I imagined the worse and assumed it all was happening around me. Yet, when I stopped imagining and focused – both figuratively and literally – on the people who really were around us, I saw that it wasn’t about our differences. I saw that these people were much more like us than I could have ever thought. From the side of my eye, I didn’t notice. I had to look directly to see who they really were. If I never did, my memory of that day would have been much different than the reality it truly was. Poetic, right? I mean, this is some classic novel fodder for English classes to debate. Yet, it happened in real life. The symbolism was shockingly on point. It was as if someone was writing this out for me to read, rather than to live. It was a reminder that while Autism is unique and special needs are special because they aren’t shared by the majority of people, they still exist outside of our home. 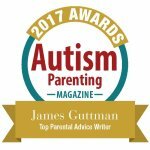 With everyone repeating that “if you meet one person with Autism, you’ve met one person with Autism”, it can be easy to forget that. It can be easy to feel alone. This boy and his family showed me that we weren’t as alone in the world as I felt at the start of that meal. There are plenty of people just like me, Lucas, and all of my loved ones. Sure, the differences can be overwhelming at first glance, but once you focus on who people truly are rather than hazy assumptions from the corner of your eye, you’ll see many more similarities than you ever did before. I know I did.